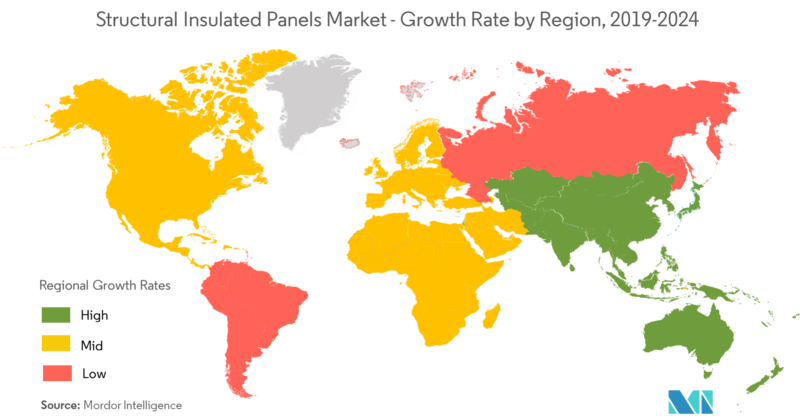 The global structural insulated panel market is expected to register healthy growth, by 2024, at an estimated CAGR of 6.13% over 2019-2024. The major factors driving the market studied are the increasing demand from the construction sector and increasing cold storage applications. 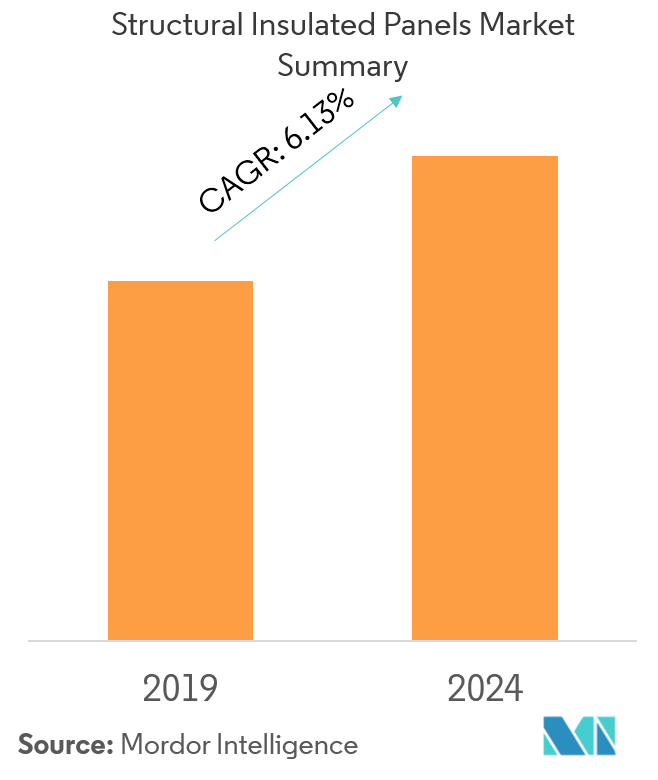 Advancements in building technologies such as modular construction techniques are expected to hinder the growth of the market studied. In 2018, the building wall segment is expected to dominate the market and expand at the fastest CAGR of 6.39% during the forecast period. This is due to the robust demand from the residential sector. In 2017, North America dominated the market, holding a share of almost 37%, and is expected to register a CAGR of 6.21% during the forecast period. This growth is primarily due to rising construction activities in Canada and Mexico. Structural insulated wall panels are generally available in thicknesses of 4-1/2 inches and 6-1/2 inches. Manufacturing of curved wall panels are possible and it is often more practical to use stud framing for non-orthogonal geometries. The whole wall R-value of a wall assembly is currently the best and the most followed method of quantifying the total thermal performance. The whole wall R-value takes the resistance of heat flown through an opaque cross-sectional area of the insulation and structure into the account while the total loss of energy at the interfaces of the wall with the roof and floor are accounted. The whole wall R-value of a 4-inch structural insulated wall panel is 14, whereas for a 2x4 wall is less than 10. The whole wall R-value of a 2x6 wall is between 11 and 13.7 depending on the quality of the installation of batt insulation. The total volume of the panels used as structural insulated wall panels is much higher, compared to the volume of the panels used as structural insulated roof panels. North America region dominated the global market share in 2017. The construction industry in the United States has not been the same in 2017 as it was in the past three years. An increase has been observed in the private construction spending over the years. The residential and non-residential construction in 2017 has increased significantly compared to the previous years and is likely to grow in 2018. 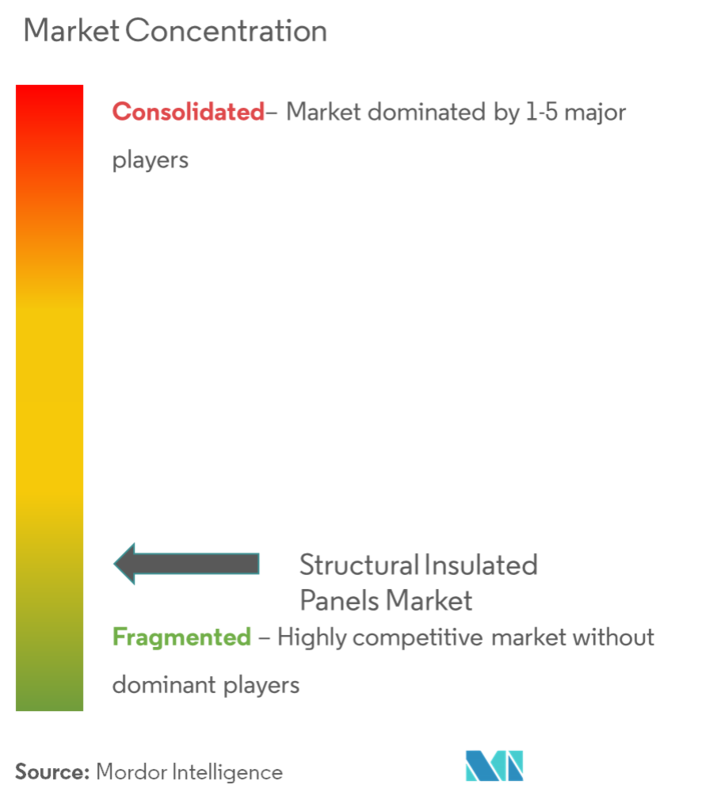 The global structural insulated panels market is a highly fragmented market with no major player accounting for a prominent share in the global market. 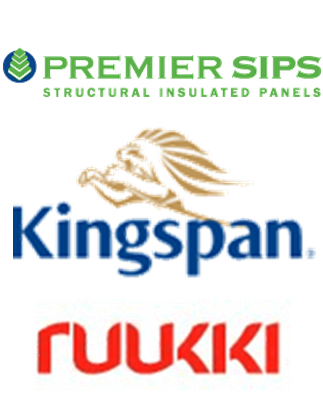 Most of the market leaders are forward integrated, i.e., they produce structural insulated panels along with providing installations and maintenance services. Premier Building Systems is the leading manufacturer of structural insulated panels in the North America region.